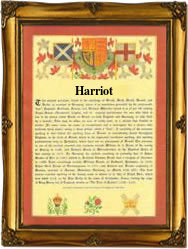 Recorded in many forms including Herriot, Herriott, Heriot, Harriot, Herrett and Herratt, this is an Anglo-Scottish surname. It has at least three possible origins. If Scottish it is locational from the lands of Heriot in the county of Midlothian, near to Edinburgh, the first recording probably being that of Lawrence de Herryhot in 1221. If English it can again be locational, but in this case from the village of Herriard in Hampshire, and recorded as Heriet in the pipe rolls of that county in 1167. The first recording of the surname is shortly afterwards, being that of German de Heriet, also in the pipe rolls of Hampshire in 1176. Thirdly the surname can be derived from the pre-medieval given name Henric, the later Henry, a Germanic personal name of the pre 7th century and composed of the elements "haim", meaning "home" and "ric" - power. Introduced into England by the Normans after the Invasion of 1066 and in the form Henri, it was the name of no less than eight English kings over four centuries. Early examples of church recordings in the diocese of Greater London include Dorothy, the daughter of John Henryiott, who was christened on November 13th 1546, at St. Mary Woolnoth, Robet Herit as spelt, who married Jone Ingram at St Margarets Westminster, on September 28th 1578, George Herriott christened on May 25th 1629, at St. Martin in the Fields, Westminster, and Kane Herrett who married George Jefferies at St Johns, Notting Hill Gate, on April 22nd 1867. Throughout the centuries, surnames in every country have continued to "develop" often leading to astonishing variants of the original spelling.